To explore, learn and experiment with developing using languages, tools and frameworks, developers often build projects under the motivation of learning. Learn to code by writing code is on the lips of many, so making projects for fun, commercial reasons or even no reason at all (besides learning & improving), is quite common. One interesting project is vue-dos-ui1 which is a one-page web application, simulating old programs in the style of the early 1990s (Microsoft MS-DOS, Turbo Vision) built using Vue.js. This app except for the awesome old style is implementing the factorial function() to calculate the result of the given integer number. 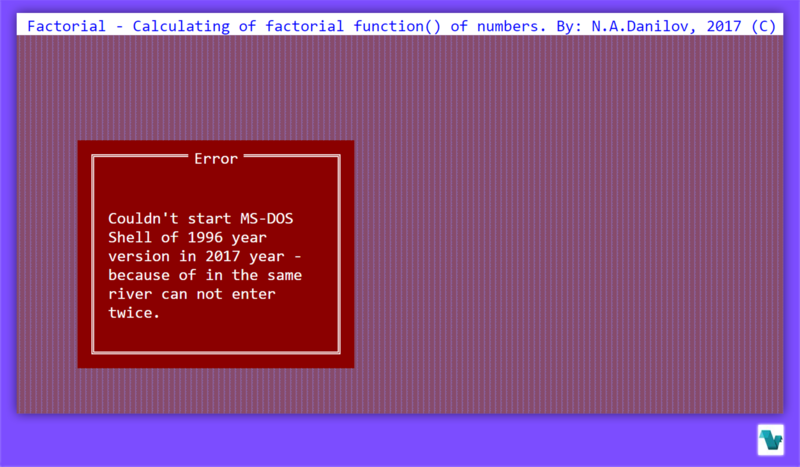 In mathematics, the factorial of a non-negative integer n, denoted by n!, is the product of all positive integers less than or equal to n.
Enjoy some retro computing at this project's live demo page. Now, this app was developed for using with devices with screen resolution from 1024x600 and higher.